What is a pet activity tracker? Pet activity trackers are wearable tech for your pet. The majority of devices are designed for dogs and they can help you keep your pet healthy and safe. There are a number of companies offering pet trackers in the UK, including PitPat, which you can sometimes get for free through some insurance companies. John Lewis Finance used to include PitPat with its Plus and Premier insurance. A tracker may be able to tell you whether or not your pet is getting enough exercise. They can track how long your dog spends walking or running, and how many calories it burns. It can also tell you how long your dog spends resting. Think Fitbit for dogs. This can be useful if, for example, your dog is with a dog sitter so that you know your dog is getting the correct amount of exercise. And you can use them to track how long you should be walking your dog every day. Some pet activity trackers have a built-in GPS system. This means you can track where your dog is in real time. This could be useful if your dog runs away at the park or if your dog is stolen. How do pet activity trackers work? Are there any risks using pet activity trackers? Which insurers are offering pet activity trackers in their deals? Pet activity trackers are designed to attach to your dog's collar. They contain a battery that doesn't heat up, so there's no risk of your dog getting hurt. You have to download an app to your smartphone to collect your data. The trackers usually connect to your phone via a Bluetooth connection. All the data from the device is transferred to your phone and you can see what your furry friend has been up to. If you have more than one dog, you can buy more than one activity tracker and collect all the data for your dogs on to the same app. 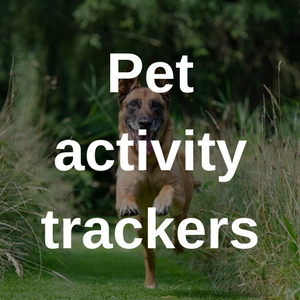 Other trackers that allow you to track the location of your pet use cellular or GPS technology to keep tabs on your pet. Bluetooth-only trackers won't be able to track your pet very far because Bluetooth has a relatively short connection distance. Some of the trackers that have GPS allow you to set a 'safe space' for your pet. This is a perimeter you can set - such as your house and garden - and if your pet leaves this area, you'll get a notification through the app. Pet insurance policies can pay out to help retrieve a pet if it is lost or stolen. And Bought By Many offers up to £6,000 of cover for loss, theft or death on the Complete policy. Find out more about our policies by joining our pet insurance group. Other insurance companies offer specific services if your pet is lost or stolen. Our sister insurer ExoticDirect will notify the National Theft Register as soon as your pet goes missing, and again when it is found. Find out more about ExoticDirect. Pet trackers do not pose any health risks to your dog. Most connect to your phone via Bluetooth and use a small battery that doesn't get hot while it is in use. They are small enough that they will not cause your dog discomfort. The PitPat activity tracker John Lewis used to offer with its Plus and Premier pet insurance attaches to your dog's collar with a simple Velcro strap. You don't need to worry about getting your tracker wet because most of them are waterproof - to an extent. The PitPat activity tracker is waterproof for short-term immersion up to 1m. If your dog is splashing around in the shallows at the beach, it should be fine but you may want to remove it if your dog is diving for toys in the pool. It's worth considering what data you are giving to an activity tracker company and what would happen to it if you stop using it or the business goes bust. Although you are covered by data protection laws, some people may not be comfortable with a company collecting GPS data. Human fitness wearable company Jawbone went into liquidation recently. Thankfully, the owner has started a new company to manage and maintain existing wearables. Which insurers are including pet trackers in their deals? Several insurers include pet activity trackers with their insurance. This is probably because RSA, the company that underwrites insurers such as John Lewis and 4Paws, has invested in PitPat. PitPat uses a Bluetooth connection and does not track your pet's location using GPS. John Lewis used to offer a PitPat activity monitor for free with any purchase of its Plus or Premier dog insurance but the offer ended on 5 October 2017. Get a quote from John Lewis. More Than's Doggyssentials dog subscription box sends treats and toys to your pet every month, and it used to include a Whistle activity tracker in the first box. It also includes More Than's Premier pet insurance. Get a quote from More Than. PitPat review The device fits on your dog's collar and tracks whether your pet is walking, running, playing or sleeping. PitPat estimates the calories your dog has burnt and allows you to set goals to make sure you're keeping your dog fit. It uses Bluetooth but does not have GPS so you can't track your pet if it is lost or stolen. It costs around £40. TabCat review TabCat is designed specifically to help owners find a cat that is missing. It uses radio frequency technology rather than Bluetooth or GPS and aims to direct you to your pet using audio and visual cues. It costs about £70. WÜF review WÜF is still in development and is more expensive than other trackers at around £125 for pre-orders. However, it has a wide range of features including a built-in speaker so you can tell your dog to stay even if it is the other side of the park, GPS, a 'virtual leash', competitions and expert advice. FitBark review This is a standard fitness and sleep tracker. It doesn't have GPS and is available in the UK for about £60 on Amazon. You can get a quote with John Lewis and find out more about the PitPat activity tracker. Or, join our pet insurance group and find out more about Bought By Many's unique pet insurance.